It's a Tuesday after work, you're tired, and you're ready to sit down enjoy a glass a cabernet sauvignon. Oh, what's that? You've got a mild yet creamy brie, and some strawberries that are perfectly ripe. What an enjoyable evening right? 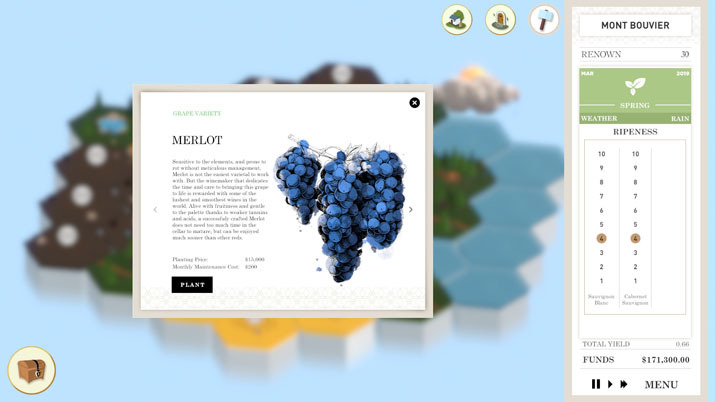 You get home from work, pour yourself some wine and start up Terroir: A Winemaking Tycoon Game and start building your knowledge of the wine world so you no longer have to pretend to be a snob about the $7 bottle of wine you just bought from your local liquor store; you can be a real snob, buying a $77 bottle of wine, breaking your bank in attempts to impress that cute cashier who probably thinks you're a high-functioning alcoholic. Welcome to Terrior: A Winemaking Tycoon. General Interactive Co. the minds behind Terrior, set the bar high when describing the game. 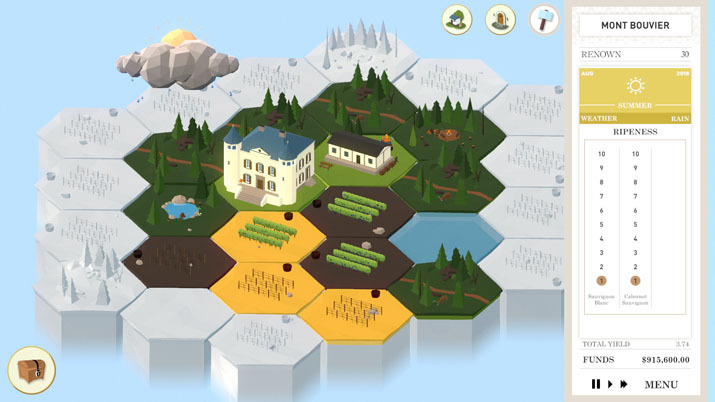 "Terroir is a game that puts the Player in control of their own wine estate. Players grow different varieties of grapes, manage the vineyard, craft wine, oversee the business and expand the estate." We start at the tutorial menu, which is your best friend, because the game tosses you in, gives you the basic idea of what to do, and what is going on. Then, you are pretty much on your own to figure out what characteristics make a wine good, the optimal way to ripen your grapes, or the pros and cons of having a good relationship with some of the wine buyers. You are able to choose from one of two types of grapes (cabernet sauvignon or chardonnay), and besides the basic information they give you, and your ability to tell that purple grapes equates to red wine, and green to white wine, you don't have much else to go off of. So, maybe pour yourself a glass of wine, and do your homework before going into this title cold. The minimalist art style of the game is quite nice, and pairs well with the music, to create a peaceful and serene feeling over the in-game years. But, at times it does feel empty. As clouds fly over head and the seasons change, the tiles of game don't have much going on, on-top of them making it feel more like a ghost town of a vineyard. As you start growing you grapes, and go through the process of selecting how to make the wine to finally sell it, you are on your own again. Year in year out, you hope that you are making the right decisions trying to improve on last year's wine, aiming for the coveted five-star rating wine, which may result in the mayor coming over to compliment you. But, because of how hands-off the tutorial is — almost overwhelmingly so — you are unsure of how to go about expanding your winemaking empire into a multigenerational business. They do provide a tutorial tab, but it requires a lot of reading, and feels more like a manual on making real wine, rather than a guide to play a game. You will likely find yourself speeding through 75% of the year as you don't do much besides occasionally trimming the foliage off the vines to optimize ripeness, till it comes time to make the wine. Terroir has a lot of promise and can be fun at times, but the experience felt lacking in body. While there is some complexity to the different grapes, weather, and characteristics of each wine, it feels inaccessible due to the repetitive speeding through of the years, only to have your wine get three stars because it's acidity was too high. It was more frustrating than anything having to restart time and time again to adjust the wine I was making, only to survive a year or two more, each play through. And with a very dry, and un-interactive tutorial, it’s hard to stay motivated to read the entire thing, and absorb the knowledge to play this game. Terroir has a lot of potential, and getting your first five-star wine is incredibly rewarding, but even a couple hundred bottles of the five-star "Booty Juice Cabernet Sauvignon 2017" is not enough to keep a vineyard afloat.